PRODUCT: 1" length x .120" wire, Hot Dipped Galvanized, RING shank, Coil Roofing Nails, Wire Collated, 120/Coil, 60 coils/box. 7200 Nails/Box. Price/Box. Ring Shank plus Hot Dipped for high wind uplift and coastal roofing, composition roofing, underlayments, etc. Meets U.S. Standards ASTM F1667 type NL RF S Q-52 Z, & FFN-105B. 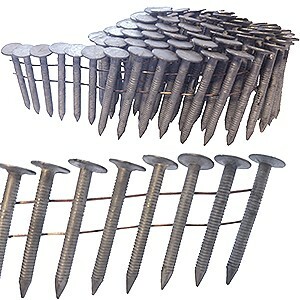 1-1/2 x .120 Ring Shank Coil Roofing Nails, Heavy EG plated for superior corrosion resistance and pull out. Wire Collated, 120/Coil, 60 Coils/Box. 7200 Nails/Box. Price/Box. 1-1/4 x .120 Ring Shank Coil Roofing Nails, Heavy EG plated for superior corrosion resistance and pull out. Wire Collated, 120/Coil, 60 Coils/Box. 7200 Nails/Box. Price/Box. 3/4 x .120 Ring Shank Coil Roofing Nails, Heavy EG plated for superior corrosion resistance and pull out. Wire Collated, 120/Coil, 60 Coils/Box. 7200 Nails/Box. Price/Box.